Presented by Nonsequitur. Period costume encouraged! 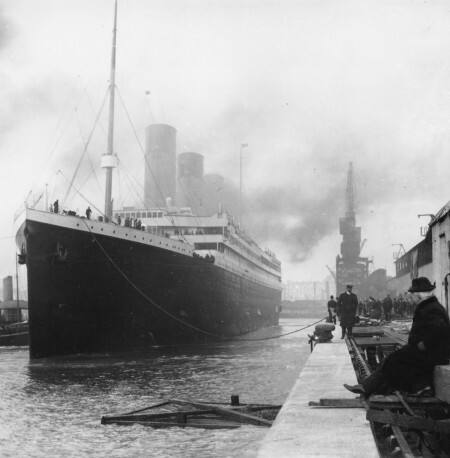 An all-star ensemble of thirty-plus Seattle avant musicians commemorates the 100th anniversary of the Titanic tragedy with an epic version of The Sinking of the Titanic (1969), by acclaimed British composer Gavin Bryars. The “score” consists mainly of Bryars’ hand-written notes speculating on the musical and sonic aspects of the history and lore surrounding the Titanic disaster – particularly the conflicting reports by survivors as to the hymns played by the ship’s orchestra as it sank. It includes his arrangements of these hymns for an ensemble replicating that of the ship’s orchestra, as well as recorded interviews with survivors. But the work is extremely open-ended and can be realized in many different ways. Directed by composer and Wayward Music Series founder Steve Peters, this performance will differ significantly from the recorded versions. It will last for about three hours, spanning the actual time it took for the Titanic to sink after hitting an iceberg in the North Atlantic on April 14, 1912. A stellar group of Seattle musicians will use the hymns as a basis for improvisation, spread out around the Chapel over six different half-hour sets: a string ensemble (violinists Claude Ginsburg and Tari Nelson-Zagar, violist Mara Sedlins, cellists Paul Rucker and Lori Goldston, bassist Evan Flory-Barnes); a wind ensemble (trombonist Stuart Dempster, trumpeter Lesli Dalaba, clarinetist Beth Fleenor, contrabass clarinetist Paul Hoskin, French horn player Greg Campbell); a solo piano set by Robin Holcomb; an accordion/concertina/harmonium ensemble (Amy Denio, Marchette DuBois, Steven Arntson, Tiffany Lin), and a vocal chorus. PLUS: Ragtime tunes on toy piano by Tiffany Lin! Period 78s spun on vintage Victrolas by Climax Golden Twins! Field recordings and sound design by the Seattle Phonographers Union! Electronic processing by composer Joshua Parmenter! Atmospheric percussion by Dean Moore and Dale Speicher! Video projections by Killing Frenzy!